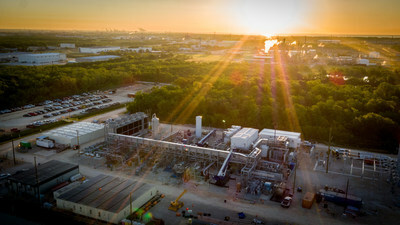 LA PORTE, Texas, May 30, 2018 /PRNewswire/ -- NET Power, LLC, today announced that it has successfully achieved first fire of its supercritical carbon dioxide (CO₂) demonstration power plant and test facility located in La Porte, TX, including the firing of the 50MWth Toshiba Energy Systems & Solutions Corporation ("Toshiba") commercial-scale combustor. Firing of the combustor involves the integrated operation of the full NET Power process. Following rigorous testing, the combustor will be integrated with the turbine and power will be generated. NET Power is targeting the global deployment of 300MWe-class commercial-scale plants beginning as early as 2021. First fire is a critical milestone for the demonstration plant, as it validates the fundamental operability and technical foundation of NET Power's new power system, which is designed to produce low-cost electricity from natural gas while generating near-zero atmospheric emissions, including full CO₂ capture. The achievement also confirms the operation of Toshiba's combustor at commercial scale, as several 50MWth combustors will be utilized together in NET Power's 300MWe commercial facilities. NET Power is a collaboration between Exelon Generation, McDermott, and 8 Rivers Capital. Constructed over a 2-year period, the company's 50-megawatt thermal (25MWe) demonstration plant is the world's only industrial-scale supercritical carbon dioxide-based power plant and CO₂ cycle test facility. "This is the exciting culmination of a process that required the hard work and dedication of our investors," said Charlie Bowser, NET Power's President. "We were also very fortunate to bring together an extraordinary group of key contractors and equipment suppliers. Because of the collaborative effort of the extended team, our achievements have fully met our expectations." "McDermott is a global leader in technology licensing for the energy industry, and NET Power is a valuable piece of our current portfolio and our long-term strategy," said Sean Sexstone, Global Vice President of Power for McDermott. "This partnership in NET Power also gives McDermott the opportunity to build energy projects that have the potential to revolutionize how we produce power and capture carbon." The plant is designed to demonstrate NET Power's Allam Cycle technology, which uses a new turbine and combustor developed specifically for the process by Toshiba. Using carbon dioxide (CO₂) as a working fluid to drive a combustion turbine, the Allam Cycle eliminates virtually all emissions from natural gas power generation without requiring expensive, efficiency-reducing carbon capture equipment. As the energy sector and electricity consumers become increasingly carbon-conscious, NET Power and Toshiba are poised to provide the market with the industry's first natural gas power generation technology that is low-cost, flexible, and carbon-emissions free. In parallel with these demonstration plant tests, NET Power is advancing the development of commercial-scale 300MWe natural gas plants. NET Power is working on projects with power generation, oil and gas, and industrial companies in the U.S. and globally, as well as a number of governmental agencies abroad. With the passage of 45Q carbon capture tax credit reform in the U.S. and the demand for low-cost CO₂ in industrial processes that use and sequester CO₂, the company sees a large demand for NET Power plants and Toshiba turbines, beginning in the very near term. Existing natural gas plants burn natural gas with air, which is a mix of oxygen and nitrogen. These technologies emit CO₂, which is difficult and expensive to separate from the nitrogen and residual oxygen. Unfortunately, this has made carbon capture uneconomic for traditional power plants. NET Power addresses the cost hurdles of older technologies with a novel process—an oxy-fuel, supercritical CO2 power cycle—that produces electricity efficiently while inherently eliminating all air emissions. The system burns natural gas with oxygen, as opposed to air. Additionally, instead of using steam, the cycle uses high-pressure CO₂ to turn a turbine, in effect turning the CO₂ problem into the climate solution. NET Power produces only electricity, liquid water and pipeline-ready CO2, as well as valuable argon and nitrogen, all while operating as efficiently as most natural gas power plants in operation today. Additionally, for a small reduction in efficiency, the technology can operate without water. The technology will serve as an affordable and reliable cornerstone of the world's clean energy future. 8 Rivers Capital, LLC is a Durham, NC-based firm leading the innovation of sustainable, infrastructure-scale technologies. As the inventor of the Allam Cycle, 8 Rivers is focusing on developing economic and sustainable uses for the CO₂ captured by the cycle, including the production of ethylene and other valuable products and the removal of sulfur impurities from gas streams. 8 Rivers is also developing technologies to deliver space launch and backbone communications at a fraction of the cost of existing technologies. For more information, visit www.8Rivers.com.